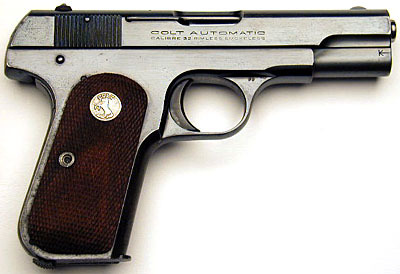 World War I Navy Colt Model M .32 ACP serial number 256799 - From the beginning of production until WWI, there was only one significant military order for the Model M. It was a 200 gun shipment ranging in serial number from 227226 to 260924 on September 29, 1917 to the U.S. Navy Yard, Washington, DC. Serial number 256799 is documented as having been part of this Navy shipment. These pistols had no special government ordnance, inspectors or acceptance markings applied at the factory. 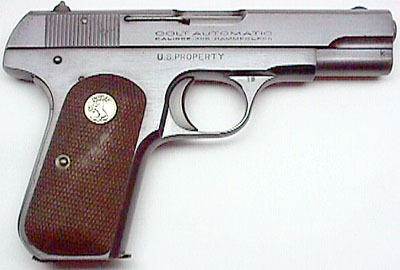 Colt 1903 Pocket Hammerless .32 ACP serial number 256799 - right side. 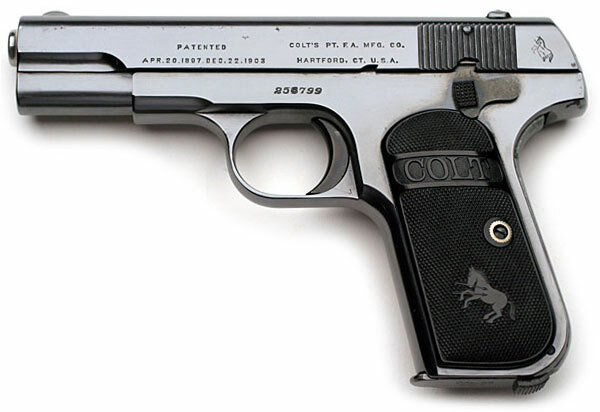 Colt Navy Contract Model M pistol serial number 557744 in .32 caliber. This blued .32 is one of 56 Model M .32 ACP pistols in the serial number range 551446 - 558605 that were shipped to the Norfolk and Washington Navy Yards between 3/24/42 and 1/25/43. 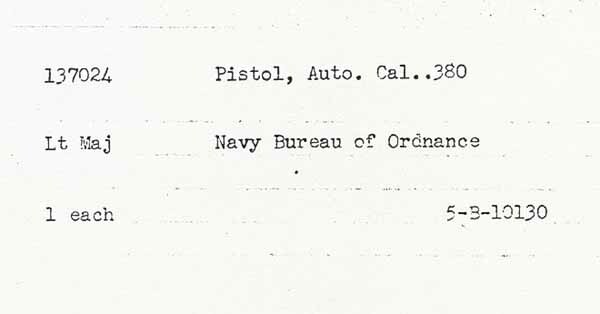 This pistol was shipped on 1/25/43 in a shipment of 8 guns "to the transportation officer, Navy Yard, Washington, D.C. for the supply officer." It has the distinguishing characteristic of having a flaming bomb ordnance mark on the upper left flat of the trigger guard. 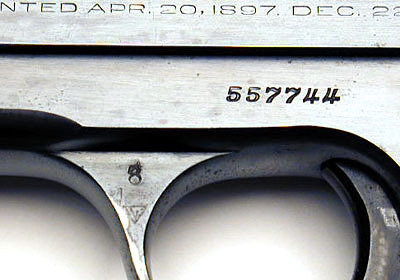 It is believed that none of the 56 pistols have the "U.S. Property" roll mark on the right side of the frame. 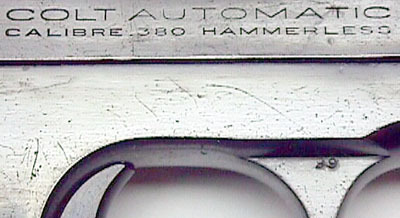 1903 Colt .32 ACP serial number 557744 - close-up of flaming bomb ordnance mark. 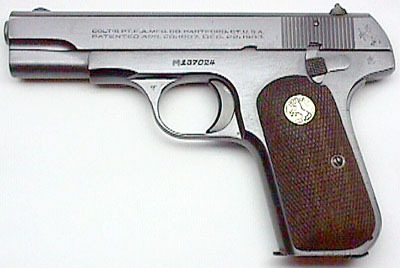 Right side of Colt Model M .32 ACP serial number 557744. Note the lack of the "U.S. PROPERTY" marking on the right side of the frame. 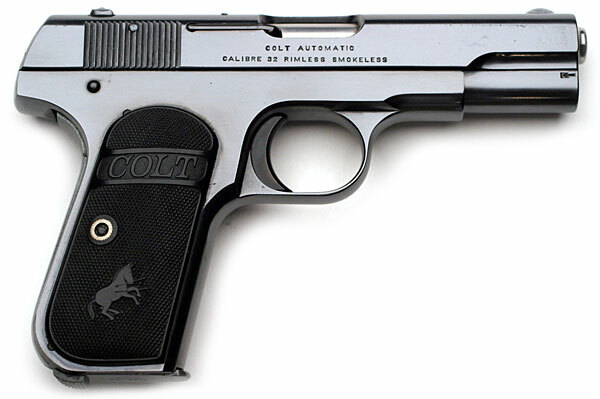 Colt Navy Contract Model M pistol in .380 caliber. 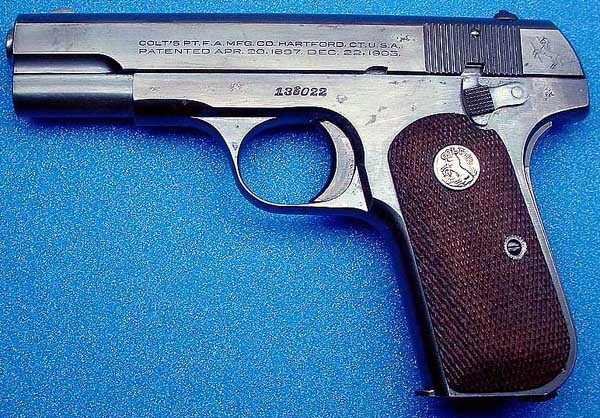 This blued .380 is one of the first 105 Blanket Procured Model M pistols procured between 3/2/42 and 1/25/43. This pistol was among 55 in the serial number range 133249 - 135019 that were shipped to the Washington Navy Yard. 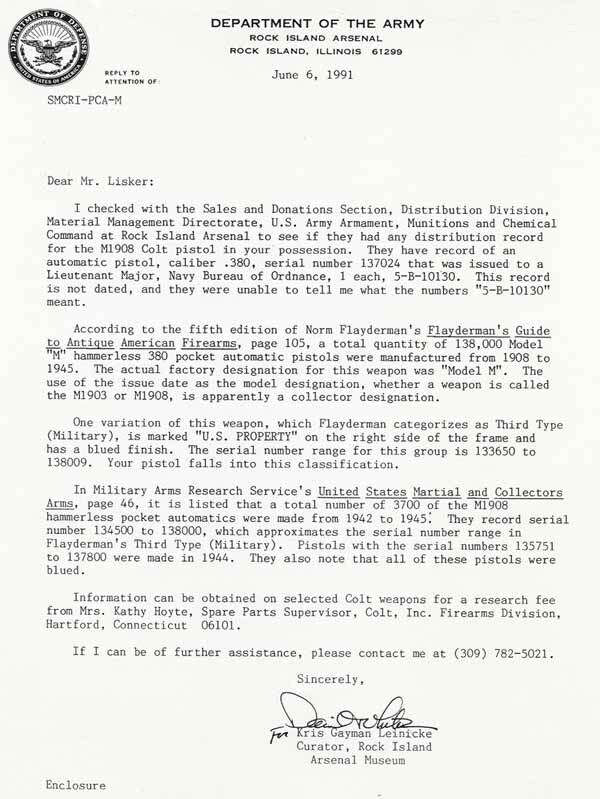 Specifically, it was one of 43 guns shipped January 25, 1943 to the United States Government, Transportation Officer, Navy Yard, Washington, DC for Supply Officer. 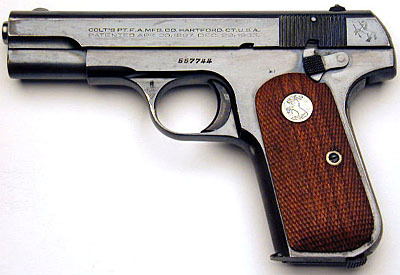 It has the distinguishing characteristic of having a flaming bomb ordnance mark on the upper left flat of the trigger guard. 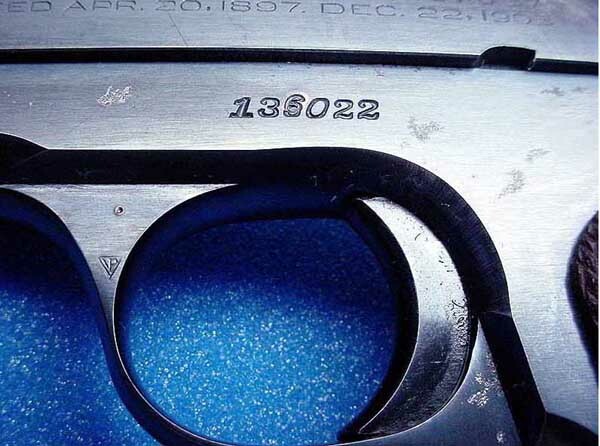 None of the 105 Blanket Procured pistols have the "U.S. Property" roll mark on the right side of the frame. 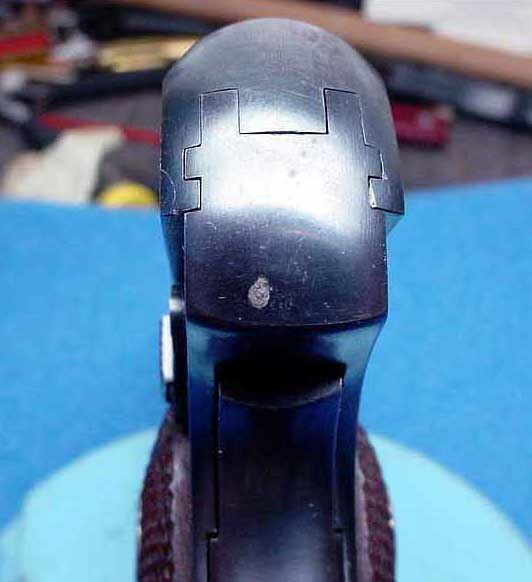 This gun also has the "M" stamp preceding the serial number on the frame and on the toe of the magazine, which indicated that it has been sent back to the Colt factory for modifications to the ejector and magazine to correct a problem that caused a stovepipe jam. Before the gun left the factory, it was re-inspected with the ordnance wheel located behind the thumb safety on the left side of the frame. Note the early style sights. M prefix and flaming ordnance bomb on the trigger guard. 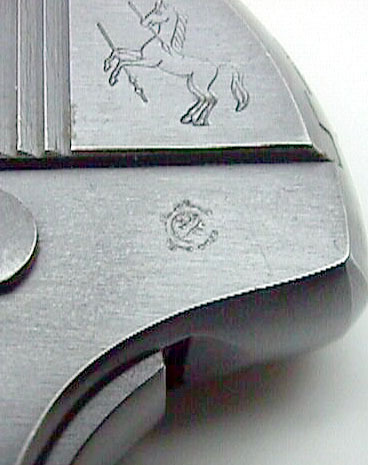 Later type ordnance wheel applied when this pistol was returned to Colt for the "M" modification. Note the lack of the "U.S. PROPERTY" marking on the right side of the frame. A later Model M Navy that was originally shipped to Rock Island Arsenal (RIA) and then transferred to the Navy. Note later type sights. 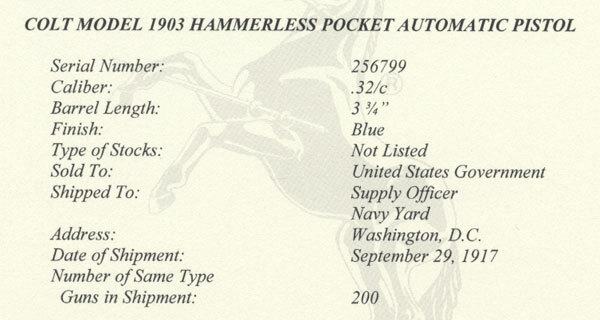 RIA Card for Colt Model 1908 Pocket Hammerless M137024. 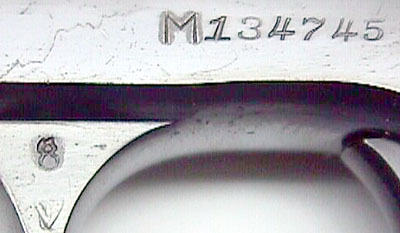 The later type ordnance mark on M137024. Note "U.S. PROPERTY" roll mark on the right side of the frame. RIA letter for 1908 Pocket Hammerless serial number M137024. 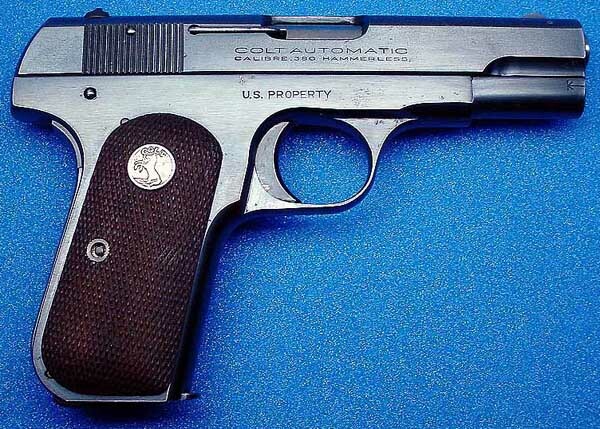 Colt Model M .380 US PROPERTY - shipped to the U.S. Navy on June 14, 1944. It has the third number (the number 5) of the serial number over struck with the number "6" on both the frame and the slide. There is also a small "6" on the rear of the slide. 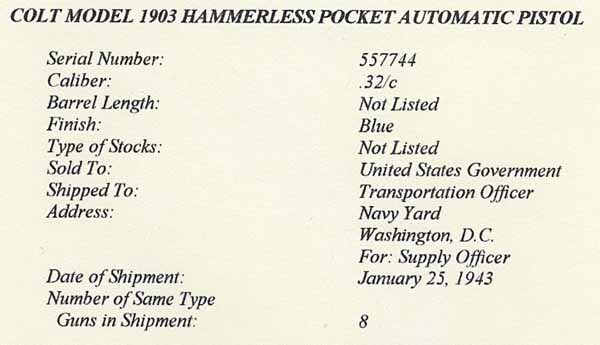 Serial number 135022 was shipped to the Chinese Embassy in Washington, DC on March 13, 1941. Number 136022 was shipped to the Navy on June 14, 1944. Serial number 136014 is also known to have the number "5" in the third position overstamped with the number "6". It also is a Navy contract gun. 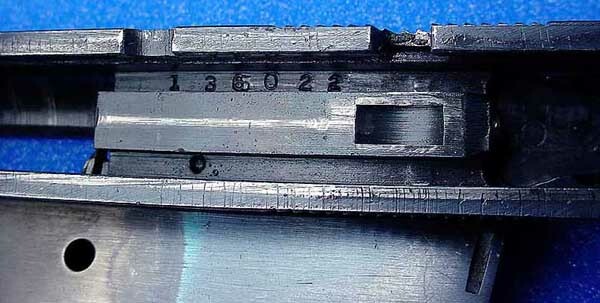 Serial number on frame showing overstrike of third number. 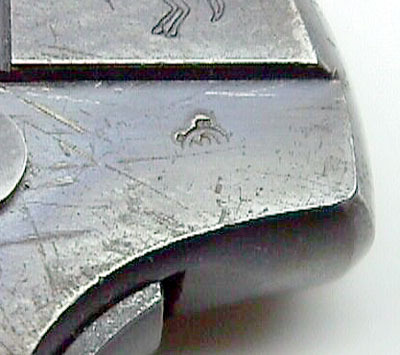 Gun also has punch dot ordnance mark on the upper left flat of the trigger guard. Serial number inside the slide with number "5" over struck with the number "6". Small number "6" stamped on the back of the frame. 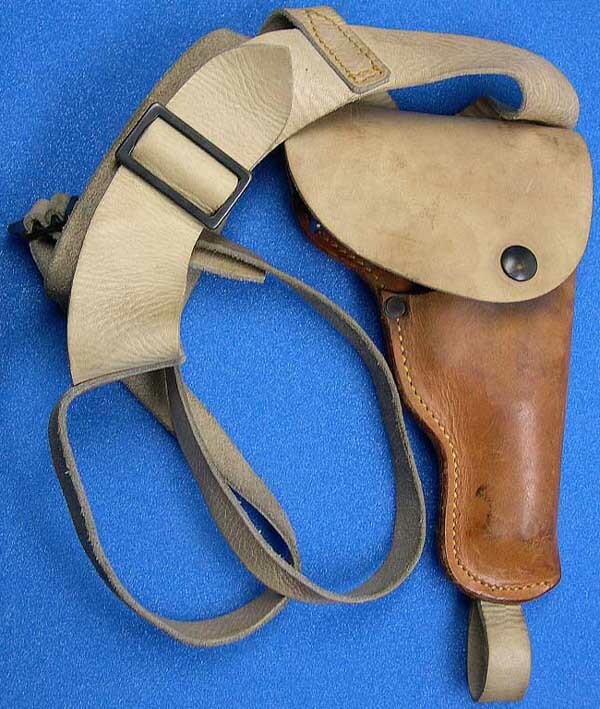 Military flap shoulder holster accompanying 136022.